Bangalore: Seven engineering students of National Institute of Technology (NIT) Surathkal, in Karnataka, received job offers from Bangalore-based outsourced product developer Aditi Technologies Pvt. Ltd in August. Last month the placement department of the institute received an email from the company that the offers had been withdrawn. “I missed (attending interviews at) 10-15 companies because I took the Aditi offer," said one of the seven, a 21-year-old in his seventh semester, who didn’t want his name revealed because it might hurt his chances of landing another job. As the global economic crisis deepens, some technology companies are revoking campus offers, while some are reducing the number of campus hires and the number of institutions they visit, and many others are hoping they may be able to recruit later this year or next year. Information technology (IT) services firms typically hire in bulk and so far provided employment to at least half the students passing out of NITs and the Indian Institutes of Technology (IITs). Chetan L.S., vice-president of the people department at Aditi Technologies, denied revoking the campus offers. “We had made offers to seven students in NIT Surathkal and those offers stand—we absolutely intend to on-board these candidates," he said. 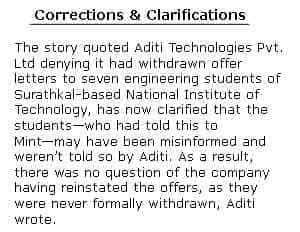 However, a placement official at NIT Surathkal, who did not want to be identified as he is not authorized to speak to the media, said, “Aditi sent an email to the placement department saying they are withdrawing the offers. We have allowed these seven students to attend other interviews." At NIT Surathkal, out of a batch of 570 B.Tech (bachelor of technology) students, 120 students are awaiting placement. At NIT Rourkela, Orissa, 98 students out of a batch of 660 are awaiting jobs and at NIT Warangal, Andhra Pradesh, 50 students out of a batch of 380 are yet to be placed, said placement officials from the respective colleges. “Engineering placements are going badly this year with only about 85% of students in NITs placed so far," says Rishi Das, director of CareerNet Consulting Pvt. Ltd, a recruiter. By this time last year, about 95-98% of students in NITs would have been placed. Placements in lower-rung engineering colleges would be bad this year, said B.S. Murthy, chief executive of Bangalore-based executive search firm BSM Leadership Capital Consulting Pvt. Ltd. “I know of some colleges in which there were virtually no takers," he said. “IT companies are taking smaller number of students this year," says a placement official at NIT Rourkela, who did not wish to be identified as he is not authorized to speak to the media. For instance, India’s third largest software exporter, Wipro Technologies, took 61 students this year as against 92 last year from NIT Rourkela. Pradeep Bahirwani, vice-president of talent acquisition at Wipro Technologies, refused to reveal the current fiscal’s hiring target given the market conditions, but said, “In 2008-09, we have made 8,000 offers so far." Companies such as Cognizant Technology Solutions Corp. and Citrix R&D India Pvt. Ltd declined to visit NIT Surathkal this year, said the placement official at the college. A Cognizant spokesman said it was against company policy to reveal campus recruitment numbers. Citrix R&D India denied any change in the recruitment strategy. “We have been visiting campuses across India every year for over five years and will be doing the same this academic year," managing director Rakesh Singh said by email. “There is no change in our plans." Even the prestigious IITs are not immune to the downturn. “In the IITs there is 30-50% fall in the number of companies (set to visit them)," says Das. IITs are preparing to start their placements next month. At IIT Roorkee in Uttarakhand, some 100 companies are expected on campus against 130-140 last year, said a placement coordinator who did not want to be identified. Apart from IT companies, the college is also missing multinational investment banks that recruited at least 20 engineering students as financial analysts last year. M.Tech, or master of technology, students have it worse. At NIT Warangal, only 40% of a batch of 250 M.Techs have been placed so far as against 75% last year by this time; at NIT Rourkela only 5% of a batch of 270 M.Techs have been placed so far..